I first cut my hair dramatically short in August 2011 (actually, I had a bowl haircut when I was 7, but that was a long time ago). I needed a change. Coming off a stressful month that ended in a somewhat risky job change, I needed to feel empowered and in control of my life. The pixie cut achieved that, and I’ve enjoyed coming to appreciate my face and neck in all of its exposed glory. I also like that shorter hair provides instant polish to any look. That being said, I yearn to change my hair often. It’s one of the few alterations you can make to your body that corrects itself over time. I’m not a risk taker by any means, but I do like to take a few risks with my hair (example: dyeing it yellow-blonde this summer). I’ve (tentatively) decided to grow my hair out, and by “out,” I mean to chin length or mid-neck length. My fine, thin hair looks best kept short. The growing process itself will make for some painfully awkward transitional hair moments, but that’s the price I have to pay for a different style, so I’m finally working up the courage to get through it. 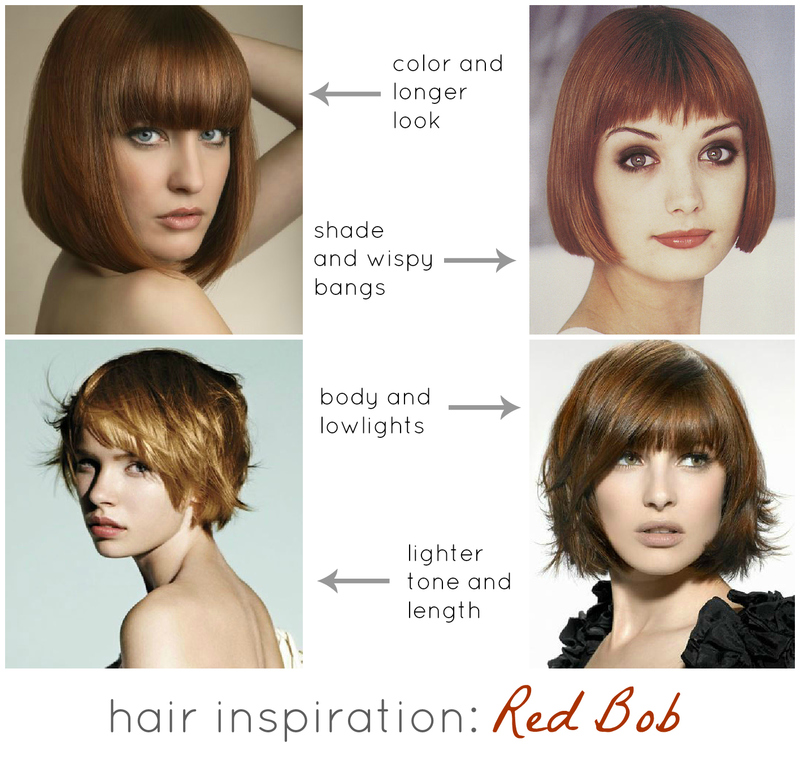 I’m leaning toward a bob-style haircut that naturally curls under. My hair responds well to the length and style. I also want to dye my hair a natural shade of red. I’m leaning toward the top or bottom left shade and the top right cut. What do you think? What hair risks would you like to take? The top left cut and bottom left color are my favorites! I was thinking that before I read they were yours, too, haha. I’m having battles with myself over my hair. Its just so thick and curly that I never look chic with it…and I always have to spend at least 30 min styling it. Sometimes I look like Bozo the clown because it poofs out on the sides. I don’t know if I should get it cut shorter or let it grown out again. How did the hairdresser style it? I know it never looks the same when you do it at home. Maybe a thicker gel or cream would help? I have fine, straight hair, so I tend to have the opposite problem. I do have an awkward cowlick in my bangs and near the back of my head, though, and I use Garnier Fiber Gum Putty to keep it in place when my hair is shorter. I also use Frizz Ease straight fixation smoothing cream to control flyaways. I’ve been using some sort of cream in my hair for years, and I recommend it.